Explore the ancient temples, natural beauty & vibrant culture of India in Jaipur, Agra, Khajuraho, and Varanasi. A perfect first-timer’s experience, this itinerary includes iconic architecture in Delhi and Agra (Taj Mahal! ), a nature & temple excursion in the tiger region of Madhya Pradesh, and a visit to the world’s oldest living city, Varanasi. Get lost in market explorations, see a Bengal tiger and other wildlife, and absorb ancient history through architectural genius. Welcome to India! Upon arrival at the Delhi airport (DEL), your driver will transfer you to your boutique hotel in the heart of Delhi. Settle in & rest up or explore the area, which is near the Karol Bagh Market. Because many flights from the west arrive late in the evening, we will not have any group activities planned. However, your Traverse host will be on site to provide options for your free time and dinner plans. Delhi hasn’t always been India’s capital, but it has played a pivotal part in Indian history as a gateway city between Western, Central and Southeast Asia. It’s also believed to be the site of the fabled city of Indraprastha, which was featured in the Mahabharata more than 3000 years ago. We’ll start our day with a visit of Humayum’s Tomb, the first of the grand dynastic mausoleums that were to become synonyms of Mughal architecture style reaching its zenith 80 years later at the Taj Mahal. After lunch, we’ll visit the famous India Gate, the President’s House and Old Delhi, home to India’s largest mosque, which is highly decorative and has three great gates, four towers and two minarets constructed of strips of red sandstone and white marble. We’ll explore the narrow streets and bustling bazaars of the old city before a spectacular Welcome Dinner of northern Indian specialties. This morning we’ll hop a train for the capital of Rajasthan, Jaipur. The whole city was painted in pink color by Maharaja Man Singh II when the Prince of Wales, later Edward VII, visited Jaipur in 1876. Today, every home within the city is obliged by law to maintain its façade. Jaipur was and remains the only city in the world symbolizing the nine divisions of the universe, through nine rectangular sectors sub-dividing it. We’ll visit the City Palace, a complex of courtyards, gardens and buildings in the center of the Old City and then head to the Jantar Mantar Observatory, consisting of fourteen major geometric devices for measuring time, tracking constellations and observing the orbits around the sun. In the morning we’ll continue our explorations of Jaipur, starting with the Amer Fort. The royal palace and old fort was from the Kachhwaha clan of Amber, which used to be the capital, until it was moved to Jaipur. We’ll then visit the “Palace of the Winds,” or Hawa Mahal. Located in the heart of Jaipur, this beautiful five-story palace was constructed in 1799 by Maharaja Sawai Pratap Singh who belonged to Kachhwaha Rajput dynasty. After lunch you’ll have free time to explore the city, which is a great place to wander around. Check out its endless variety of crafts, including enamel-on-gold pendants, studded on the reverse with precious stones or pearls & turquoise that one sees in miniature paintings. Jaipur's lacquer bangles are famous all over the world. Today’s a big day with our visit to India’s iconic architectural symbol, the Taj Mahal. Built by Emperor Shahjehan in 1631 for his wife Mumtaj, it is an experience of a lifetime. Both Shahjehan and his beloved are buried in peace there and their immortal love story is witnessed by thousands of people every day. The Fort of Agra is an imposing edifice built by Emperor Akbar and his descendents in the 16th and the 17th centuries. It is best known for its room where Shahjehan was placed under house arrest and where he died looking at the monument he made for his beloved. Between our excursions, we’ll visit our community partner, a social-enterprise café that supports women who have experienced an acid attack. We’ll learn about the cultural underlyings of this atrocity and what is being done to change this practice that affects so many Indian women, particularly in rural areas. This morning we’ll hop a train to Jhansi and head to the magical village of Orchha. Nestled on the banks of the Betwa River, Orchha was founded in the 16th century by the Bundela Rajput Chief, Rudra Pratap. Here, the river splits into seven channels known as the Satdhara. Legend goes that this is in honor of the seven chiefs of Orchha. We’ll visit the Orchha Fort, located within an island formed by the confluence of the Betwa River and Jamni River in Orchha town approached from the eastern part of the market in the town through a multiple arched bridge with 14 arches built in granite stones. We’ll also visit the Jehangir Mahal, which has 236 chambers laid around a vast, central courtyard. We’ll also visit the Laxmi temple, dedicated to the goddess of wisdom. Before dinner, we’ll walk down to the local temple in time for an aarti ceremony with the local community. After all the time in temples, forts and city it’s time to escape into nature! 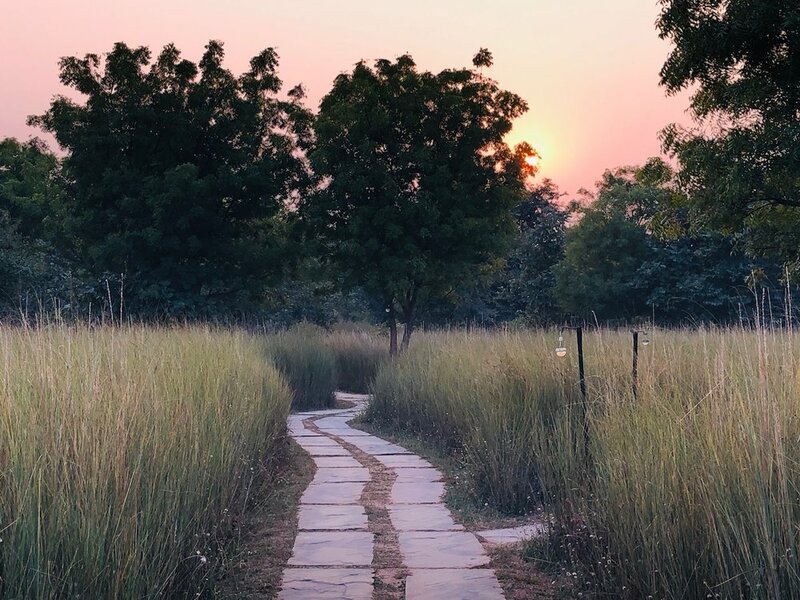 Today we’ll transfer to a beautiful eco-lodge at the Panna Tiger Reserve, which has witnessed the most successful tiger reintroduction program in Madhya Pradesh and has a small but growing population of about 40 tigers. You’ll have the afternoon to relax in the gardens, take a boat ride, and soak in the sounds of birds and buzzing insects before a fabulous home-cooked feast of locally sourced, homestyle Indian cuisine. In the evening, we’ll watch a documentary on our husband and wife team hosts, both of whom are naturalists who have been studying tigers and wildlife for 20+ years. Wake up bright and early today for our tiger safari! We’ll drive through teak and acacia forests looking for the elusive Bengal tiger as well as leopards, sloth bears, sambar, antelopes and a variety of other flora and fauna. We’ll be accompanied by experienced wildlife guides and naturalists who will explain each animal’s important role in the local ecosystem. After lunch, you’ll have time to relax or take a walk into the small local village to see what rural life in India is like. We’ll enjoy another fabulous homecooked Indian meal together for dinner. 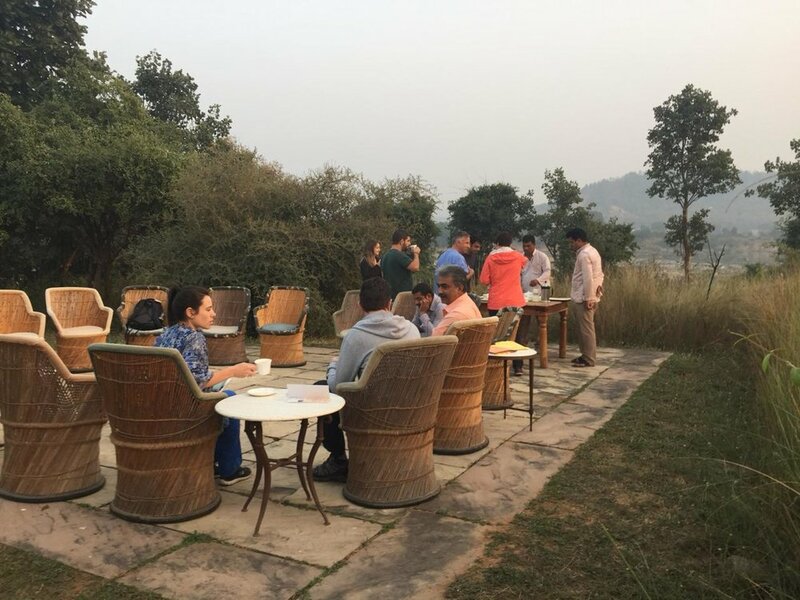 After breakfast, we’ll pack up and say goodbye to our lodge friends before visiting the Western Group of Temples at Khajuraho, believed to be the religious capital of the Chandellas. After fall of Chandella dynasty (after AD 1150), the 85+ Khajuraho temples suffered destruction & disfigurement by Muslim invaders in this area, which forced local people to leave the city. From about 13th century to 18th century, the Khajuraho temples remain in forest cover, away from popularity until it was re-discovered by British engineer T. S. Burt. An UNESCO World Heritage Site, the 25 remaining temples today have awed generations of people with their architectural brilliance and intricate carvings and represent peace and coexistence between the Hindu, Muslim and Buddhist faiths. In the afternoon, we’ll take a short flight to one of the oldest cities in the world, Varanasi, also known as Kashi or Banaras. According to Hindu mythology, the city was founded by the god Shiva. 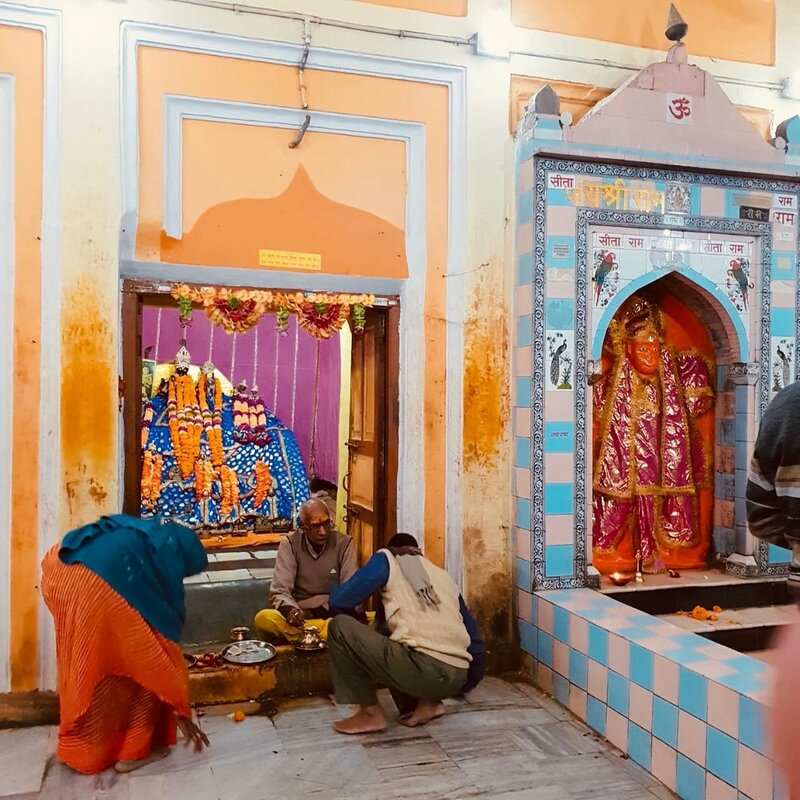 Banaras is still called ‘The City of Shiva’ and devotion to Shiva and references to the city are frequently found in ancient Hindu scriptures. After checking in to our hotel, we will take part in an evening aarti ceremony, viewing it from the Dasawamedh Ghat, where beautiful rituals are performed involving brass lamps, prayers and chants. After a morning boat ride on the Ganges river, we’ll go just a few miles away to the sleepy village of Singhpur. While Varanasi is a Hindu religious center, Singhpur’s Sarnath is a Buddhist center of religion where Gautama Buddha first came and taught about the concept of Dharma. The crumbling stupas built by Emperor Ashoka here are a house of relics, with manuscripts and fascinating inscriptions that can teach one Indian history. We’ll visit the archeological museum in the afternoon and will reconvene in the evening for a fabulous Farewell Dinner to share all we’ve learned together. We’ll depart early on a short flight from Varanasi back to the Delhi airport. Plan your international departing flight no earlier than 12:00 noon. Your guided trip ends here at the airport, or opt to add on an extra night or two in Delhi or onward travel to one of our add-ons in southern India, Sri Lanka, Bhutan, or Tibet. Add-on options are available for after the trip with our fantastic, local guides. Please click to download info sheet and contact us with any additional questions. Ashley Blake is an avid traveler, cultural consultant and Traverse Journeys founder with a background in tourism, entrepreneurship and project management. She is a fluent Spanish speaker and has worked and traveled in 40+ countries across Latin America, Asia, Europe, the Middle East and Africa including tours she has led in Spain, Ecuador, Germany, Nicaragua, Morocco, China and Canada. $250 deposit due on booking. 50% remainder due 30 days after initial invoice. Balance due 30 days prior to trip start. Cancellations, less the deposit ($250), are refundable up to 90 days before trip start date.